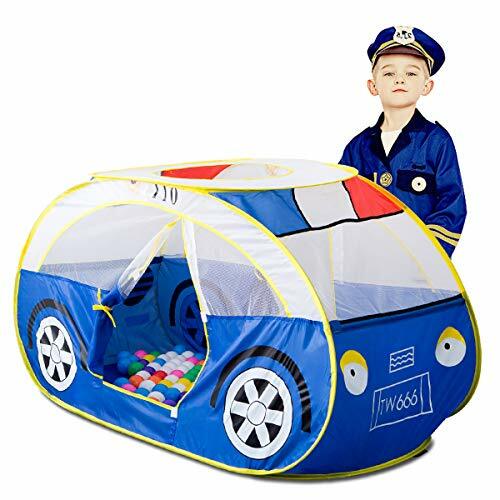 There's nothing quite as magical as watching your little one's eyes shine bright as they are receiving the Artiron Police Car tent, A large tent designed specifically for early learning fun and play, the colorful playhouse features two entrances for crawling, exploring, and imagination. Thanks to flexible fiberglass rods, your child's tent sets up quickly and easily, It's also easy to clean,and tough enough to stand up to kids running in and out, playing hard, and making messes, this Cool Car Pop up Tent transforms any corner of the house into a Lovely Play Space For kids, also the set-up is quick and simple and the teepee folds up for easy storage. seeks to delight and enrich kids of all ages through beloved games, intrinsic play and engaging activities so that leisure time is always fun, This Indoor Outdoor Kids play tents Playhouse is the perfect getaway for your little one to have their own private space. Warm tips: because the tent made of soft material, Due to folding packaging and long-term transport,our item may be a little clutter and folds when you open the package. But please don't worry,just hang up several days, it will back to the original look, if you have any product issue, please contact us, we will help you within 24 h.
Warranty: Police Car Play Tent are covered by a 6-month replacement warranty (there are relevant solutions provided, such as return, replacement, refund,and so on. ) - if you have any product issue, please email us at "Contact Seller" firstly in your account orders and we'll help you through the exchange. If you have any questions about this product by Artiron, contact us by completing and submitting the form below. If you are looking for a specif part number, please include it with your message.